Lembongan Island Bali is famous for its natural beaches. In addition, the beaches here have cristal clear water that very indulgent to the visitor. This island is an awesome place for snorkeling activities. Lembongan Island snorkeling offers a beautiful panorama underwater, coral reefs, and supported by the warm water conditions and crystal-clear visibility. Lembongan is one of the three islands, include Penida Island and Ceningan Island. This island is located in the administrative area of the District of Nusa Penida, Klungkung Regency, Bali. Let's take a closer look to the amazing of Nusa Lembongan! This beautiful island offers panoramic attraction in the form of its natural beauty. The situation is far from crowded and hectic situation. The climate here is classified into "Somewhat Dry Climate" (Bali Climate Classification Map based on Schmidt-Ferguson). The rainy season start on December until March. The Island is separated from Bali Island by Badung Strait. Nusa Lembongan consists of two villages: Lembongan Village and Jungutbatu Village. 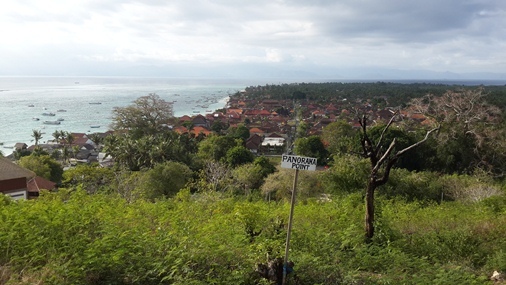 Nusa Ceningan is included in the administrative area of Lembongan Village. Nusa Lembongan is an awesome place and the best off beach snorkeling in Bali. Lembongan island snorkeling offers a beautiful panorama underwater, coral reefs, and is supported by the warm water conditions and crystal-clear visibility. The Mangrove Point Nusa Lembongan is one of the famous snorkeling locations in Bali. Mangrove point is located at the northern end of the Jungutbatu Village. The current conditions here are very light. Nusa Lembongan mangrove snorkeling is an easy drift snorkling. The drift snorkeling Nusa Lembongan is just simply floating passively while using snorkeling gear and allowing the light currents to carry you across the sea water and explore a colorful underwater. The conditions of coral reefs are healthy and spacious with lots of tropical fish. High tide is the best time for snorkeling at mangrove point Nusa Lembongan. This island has beautiful of coral reefs and tropical fish are colorful with huge variation. More than 250 species of fish during the latest survey by marine biologists. The other snorkeling location include: The Wall, Manta Point, Crystal Bay, and Gamat Bay. The Wall is a natural channel which lies between the island of Nusa Penida and Nusa Ceningan. The conditions of coral reefs are very rich here with an abundant amount of fish. But keep in mind that this location is a natural channel, very deep, and has a strong current. It would be a challenge. Manta Point, Crystal Bay and Gamat Bay are located on the island of Nusa Penida. Visitors can cross to Nusa Penida or use a snorkel package. 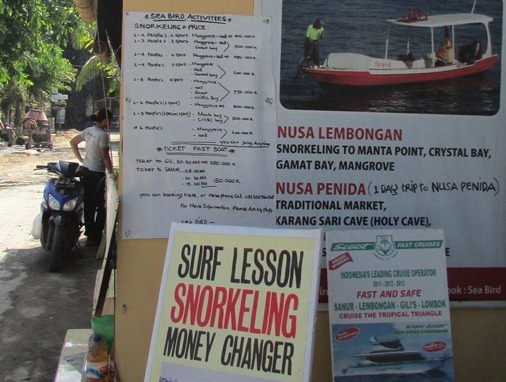 The package price for Lembongan Island snorkeling is between IRD 300,000 - 700,000 IRD. Snorkeler number between 1-6 people with 2-4 snorkeling spot. Dream Beach. 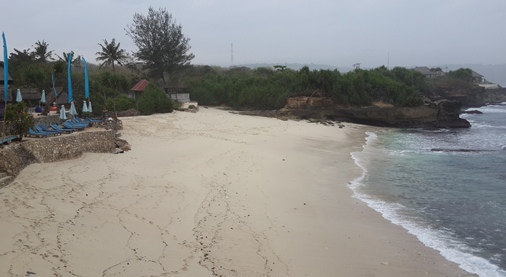 This beach is located at Jungutbatu. The beach offers natural beauty of white sand and very beautiful panorama. Visitors are very happy to spend time in this place. Sunset Beach / Sandy Bay. Location Sandy Bay in the north of Dream Beach. The beach is not too wide but offers a panoramic beauty, waves and white sandy beaches. Tanjung Sanghyang Beach / Mushroom Beach. This location is a boat landing place in Lembongan. Water is very clear with white sandy beaches. Suitable for swimming, snorkeling, diving, surfing or just relaxing on the beach and do nothing. Other Beach. There are another beach at Lembongan such as Songlambung Beach, Jungutbatu Beach, and Sakenan Beach. 2. Diving. Diving activitiy is suitable on this island and supported by the quality of the water as clear as crystal. There are many Diving service providers with the rate varies between providers. Travelers can perform activities Diving at several locations in Lembongan, such: Blue Corner (one of the emergence location of famous fish, Mola Mola), Sakenan Point and Long Point. 3. Water Sport. Recreation and water sports also available such as: sun bathing and swimming, surfing, canoeing, banana boat, parasailing and semi-submarine. This activity is usually done by visitors who take along their families. 4. Surfing. Surfing activities is situated in Jungutbatu at Shipwreck Point and Dream Beach. This location has good waves for surfing. Nusa Lembongan is known as tourist destination due to the activities of surfing and since long was a part of Bali surfing circuit. 5. Sailing. Sailing tour is usually done in the afternoon so that tourists can enjoy the sunset. This activity is located in Cape Coast Sanghyang collaboration with local fishermen. 6. Fishing. Fishing can be done personally or together with the fishermen. To get to Lembongan can be done by marine transport (can also by using helicopter). 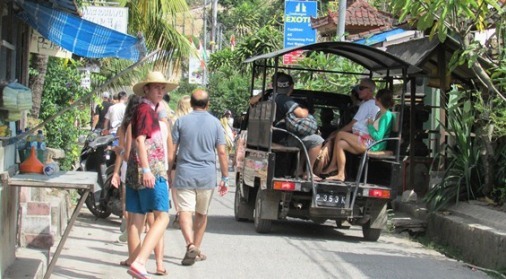 The transport Lembongan Island Bali includes fast boat, cruises, and private boat. Visitors can access this marine transportation through the Sanur Beach, Benoa Harbour, or from the Big Island of Penida Island. The time arrival and departure by marine transportation is strongly influenced by the tidal wave. 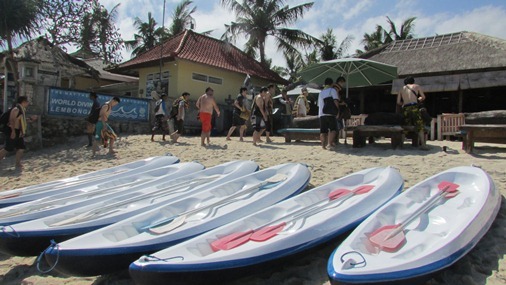 From the Sanur beach , visitors can use a fast boat, motorized boat, and big boat. You can directly buy tickets at the Sanur beach or make a reservation through the website of the boat provider. From the Benoa Harbour, you can use the services of yacht (day cruises), fast boat, or fast catamaran. And from Penida Island you can use a public boat or by rent a private boat. Using a boat with a paid ticket and shipped through the Buyuk Port or Toyapakeh Port. Using a rented boat you will be more flexible to manage time. Make sure the boat price with the boat owner before you decide to use a rented boat. Local Activities. The main activity of local residents is farming and trade. Agriculture is the dry land agriculture by relying on rain water. Many trading activities carried out in the central activities of the crowds. Seaweed cultivation is an Unique activities in Lembongan. We can see the farmer planting the seaweed, maintaining and harvesting the seaweed with a boat. After drying process the seaweed sold to collectors. Culture and Language. Local residents in Lembongan embraced Hindu as majority religion. Many religious activities are carried out like another region in Bali. The language used in Lembongan is Bahasa Bali as the local language and the Bahasa Indonesian as second language. English language has been understood and widely used. Safety and Health. The situation in Lembongan are safe. The report of crimes both large and small are very rare. There are health clinic (small clinic) in Jungutbatu region were very helpful to handle minor ailments. But for a serious situation, it's advisable to return from the island to get better health care in Bali (main island). Lembongan is free of Malaria and no cases of rabies. Communication and Internet. Lembongan is served by telecommunications networks. Personal cell phone can make calls both of Lembongan and vice versa. For public phones such as Wartel (Warung Telekomunikasi) are also available though the pricing is a bit hight. 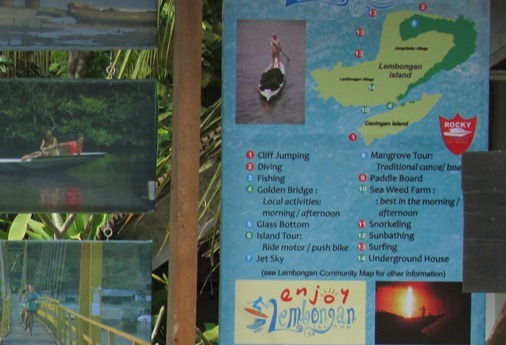 Lembongan is also served by a internet network. The internet facility is also provided by the hotel, café and restaurant. Accommodation. Lembongan has a broad range of accommodation from budget accommodation class, medium class, and splurge. For budget accommodation class with the available budget the rate less than Rp 300,000 per night. Medium class between 300,000 - Rp. 1,000,000 per night. Splurge class ranges from Rp 1,000,000 and above per night. In addition, there are also Private Villa with a rate above Rp. 1,000,000 per night. Get Around. To get around in this amazing island there are several ways you can do such as hire a motorbike, using public transport, rent a boat, using a bike even walk though. There are many motorbike rental. The rate ranges from Rp. 50.000 - Rp. 100,000 and can be used all day. Alternatively you could rent a bike. Visitor can rentals bicycle at the hotel or place where you stay at the rate ranges from Rp. 20,000-Rp 30,000 per day. You Can also use the boat. You need negotiating with the owner of the boat charge. Usually around Rp. 30,000 one-way. This islad is served by public transport (pickup truck that has been modified by adding a roof). This transport model is high recommended if you are traveling using a large and heavy bags. Walking is also no less interesting. Lembongan offers a panoramic view of the beach and sunset through footpath that connects the inn, hotel and restaurant. Eat and Drink. You don't have to drive around looking for a place to eat and drink. Tourist spot in here is like another tourist spot, there are many cafes and restaurants that are attached to the inn (hotel) or clustered around it. There was also plenty of food stalls with typical menu is fish. Relaxing and drinking places on this island is very rare except on cafes and restaurants which usually attached to the inn and hotels. Money and Buy. For the purposes of payment, the hotel and inn providing credit card services. Also there is an ATM and money changer but rare. Therefore, visitors are strongly advised to bring enough money. Due to the dry conditions of the island are advised to to buy sun-block. For souvenirs you can buy at the souvenirs stalls. Return From Lembongan. From here you can continue the tour to Penida Island the biggest of three islands. The situation in Penida is not as busy as Lembongan. Tourism support facilities are also located on Penida Island. If interested, you can continue traveled to Lombok and the Gili Trawangan. You can also directly back to Bali through Sanur Beach and continue to another tourist spot in Bali. Lembongan Island Bali offers panoramic attraction in the form of its natural beauty and has situation that far from hectic and crowded. This island is famous for its beautiful natural beaches and the cristal clear water is perfect for snorkeling and diving activity. The attractions are mostly natural. The coastal landscapes, sunsets, and amazing beaches are a key to draw visitors. An attracting and beautiful island in Bali. Take your time to travel to Lembongan Island Bali, hopefully helpful and thank you!